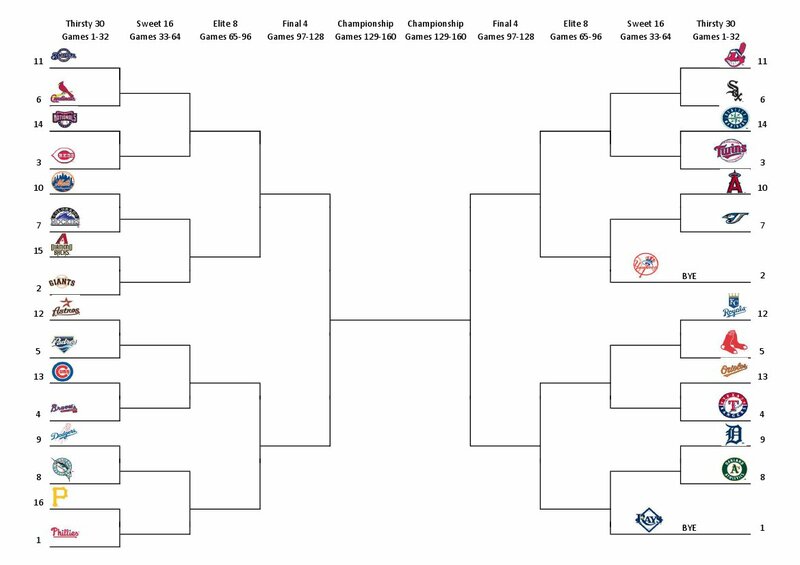 For those who are interested, here is the seeding for the 2011 Baseball Tournament based on final regular season standings. Unlike last years debacle (final results are in the post below), we'll open this tournament up to everyone. All you have to do is claim one team per blog in the comment section. The kicker this year will be that the winner will receive a lot of non-baseball cards. With your team selection, enter your favorite NBA, NFL and NHL teams. The grand prize winner will get all of the cards I have for their favorite NBA, NFL and NHL teams. Anyone can pick the same teams, as there will only be one winner. The runner up will get the grand booby prize, which will be determined, but I'm thinking that my Mork and Mindy, Close Encounters of a Third Kind, etc. cards need a new home, preferably not mine! The tournament will function as follows. The seeds are based on 2010 regular season records. Each round is broken into 32 games. Whichever team wins the most games out of those 32 games advances. Therefore, the first round consists of which team has the better record from Games 1 through 32. Second round is Games 33 through 64, etc. Tie breakers are based on best head to head record, then run differential. I'm calling the first upset of the year... Nats talke out the defending champ Reds! What the hell, I'll take the Dodgers. I'll take the Padres. Blazers, Chargers and Flyers. Go Cubbies! CHC for me. Tigers for the win. Any Packers when I do when. Don't really have favorites in the other sports, so I'll just say the MN teams there as well. I'll take the Reds again, why not? And Steelers, Penguins, and uhm, I don't watch basketball at all - are the Raptors still a team? I like dinosaurs. Are the A's still available? If so... San Jose Sharks, Green Bay Packers, & Los Angeles Lakers. I forgot to pick my other teams-Colts and Grizzlies. I don't know a thing about hockey, and definitely not any of the teams. I'll take the Red Sox. My other favorite teams are Steelers, Penguins, and Celtics. White Sox. As for non-baseball teams... Bears, Bulls, Blackhawks. What the heck, Yankees please! very much. I am new to your blog thanks to Troll's link and like it I'm game. Mets please. I'm in for the Mariners. As for the rest how about Seattle SuperSonics, Seattle SeahawksN and the San Jose Sharks. Since Troll led me here I'll represent the Rays. Falcons, Hawks and Blackhawks. I like Chris Chelios better than the Thrashers eight now. Texans, Rockets and... hockey? what is this "hockey" you speak of? lol... I guess I'll take the Minnesota Wild, they're still in the NHL right? What the heck...I'll try the Rockies along with Bears, Bulls, Blackhawks. Awesome idea for a contest! No one's taken the Brewers yet? I'll go with them. Once upon a time I was the mascot for the Diamondbacks' low-A team, so I should probably pick them and an obvious first-round exit.